In positive psychology, flow, also known as the zone, is the mental state of operation in which a person performing an activity is fully immersed in a feeling of energized focus, full involvement, and enjoyment in the process of the activity. 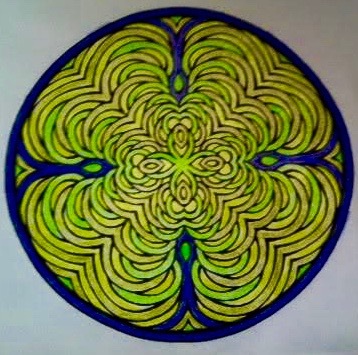 I experience the zone when I am working with clients in the gym or training my horses, yet could something as simple as coloring also bring me into the flow? Initially, to just color simply felt like a return to my childhood, yet I was totally involved without moving my body with a quiet still mind while the time slipped by with total unawareness. This week I found myself feeling especially stressed out about things not going the way I planned. Before I could wander around in my usual de-stressing choices, I picked up my coloring book. Within 30 minutes, coloring brought me back to my center in a way that my other “take me away” tricks of reading, checking emails, paper work, distraction eating or looking at horse videos couldn’t match. 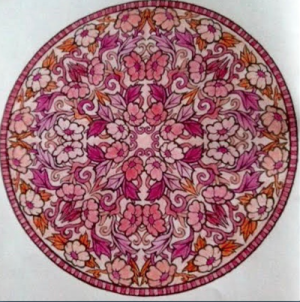 By the time I finished with my beautiful rose mandala I felt peace. The act of letting the colors choose themselves allowed me to let go and go with the flow, waiting to see how it turns out and trusting in natural outcomes, leaving me feeling balanced, calm and knowing the solutions will appear. Deciding to add coloring to my daily ritual has given me an effective and powerful tool be in the flow or to return to a focused and relaxed state. Finding a state of flow in the 21st Century has been an incredible gift to myself. I encourage everyone to give it a try. While Googling for my blog post, I read, “Adult Coloring Books are not going away.” Why not join in the fun and see how it feels to be in the flow!